We don’t have central air and so when the temperatures start to rise, we head to the grill for our cooking. We love grilled chicken, burgers, hot dogs, and steaks but sometimes side dishes are hard to come by. One that I have found that we all really enjoy that can be make on the grill is Grilled Potato Packets. First peal, wash, and slice up as many potatoes as you will need to feed your family. I use nine. Then you can put them in the foil just like that or to cut the necessary grilling time, cook the potatoes in the microwave for several minutes until they begin to get soft or boil them in water on your grill burner until they are soft. Place them on a large piece of aluminum foil. Next, slice up an onion and a pepper. You can use multicolored peppers or just the green ones. Whatever you have or like. Place these on top of the potatoes. Salt and pepper to taste. Finally, slice 1/2 stick of margarine or butter and put on top. Cover with another piece of foil and fold up the edges. Grill for approximately 10 min or until potatoes are thoroughly cooked. Flip them every couple minutes to keep them from burning. Be careful when you open your foil packet, it will be steaming HOT! Those look wonderful! We grill potatos as well but use olive oil and various hers. They disappear from the grill fast! Hi Carrie, I really like this idea and am going to pin it. 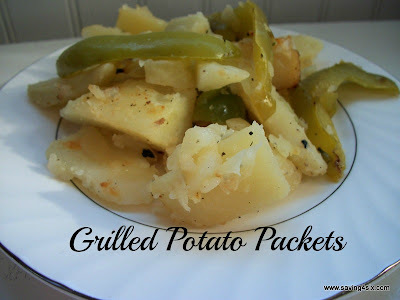 Husband loves to grill and we would all like this side dish. I think if I needed to do it ahead, I could lightly boil the potatoes first, then have the whole packet ready in the fridge to cook when husband does the cooking. Hi Carrie… This looks delicious…. I would love it if you would come link up to my 1st…Clever, Crafty & Creative Linky Party! Carrie: These look yummy. Wish I knew how to grill. It’s on my “to learn” list. Have a lovely day! The flavor of your Potato Packets would just be delicious. Hope you are having a great summer weekend and thank you so much for sharing with Full Plate Thursday.